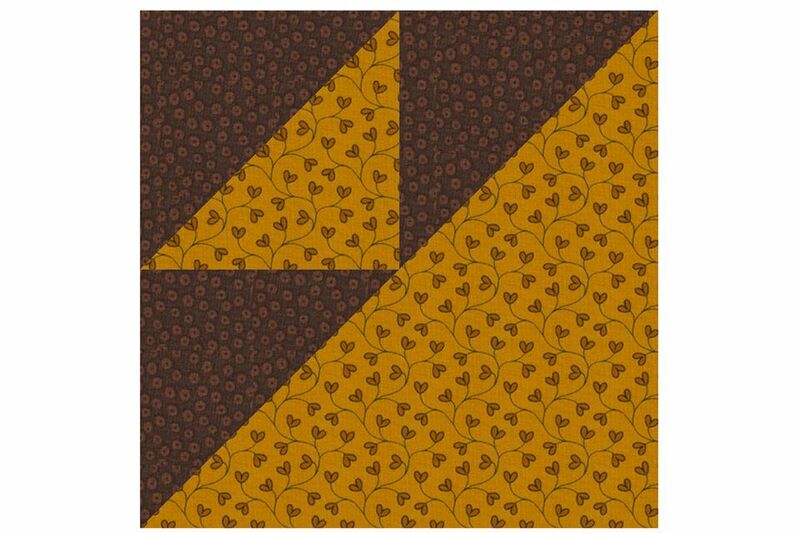 This simplified Maryland Beauty quilt block pattern is a perfect for quilt block exchanges. The quilt block is not difficult for beginners, it doesn't have lots of patches, and a mixture of Maryland Beauty quilt blocks makes a fantastic scrap quilt. Find the four dark triangles created by slicing the two remaining dark squares in half once diagonally. Sew one triangle to the bottom of a half-square triangle unit, aligning straight edges along sides as shown. Press the seam allowance towards the new triangle. Sew another dark triangle to the right edge of the half-square triangle unit, aligning the two as shown. Press seam allowance towards the triangle. Repeat, sewing remaining dark triangles to the second half-square triangle unit. Fold the Step 4 unit in half along its diagonal to find the center point of its longest side. Do the same for a large tone on tone triangle. Sew the two together as shown, matching centers and outer edges. Press seam allowance towards the large triangle. Repeat to make a second simplified Maryland Beauty quilt block. Quilt blocks should each measure 1/2" more than their finished size.